Mazak's VC-500A/5X Vertical Machining Center has a trunnion-style rotary/tilt table that allows for the accurate, cost-effective processing of small complex parts via full 5-axis machining. The machine also features the MAZATROL SmoothX CNC that allows for easier programming and faster part cycle times, in either EIA or MAZATROL conversational language. The VC-500A/5X comes standard equipped with a robust, high-performance CAT-40, 12,000-rpm spindle that delivers exceptional metal removal capabilities in all common materials, including steel, aluminum and cast iron. Optional speeds of 15,000rpm and 20,000 rpm are available to address a variety of part production requirements. Now with 60-tool capacity, the new tool magazine on the VC-500A/5X helps reduce set up time, allows for redundant tooling and provides more unmanned uninterrupted operations. In tandem with the magazine, the machine s automatic tool changer provides fast tool exchanges for an overall reduction in non-cut times. Furthermore, reliable tool monitoring on the VC-500A/5X maximizes production efficiency and lowers operating costs via early problem detection. Axis travels for the VC-500A/5X measure 19.88" in X, 19.88" in Y and 20.07" in Z, allowing it to accommodate part sizes up to 19.68" in diameter and 12" high. Rapid traverse speeds for these three linear axes are now 1,181 ipm. To minimize thermal displacement, Mazak incorporates an oil chiller that cools the VC-500A/5X's head and table. The machine's trunnion-style rotary/tilt table is constructed with durable high-speed roller gear cam drive technology for high torsional rigidity and positioning accuracy. The table tilts +110 degrees / - 110 degrees in the B-axis and rotates 360 degrees in the C-axis and can accommodate workpiece weights up to 440 lbs. 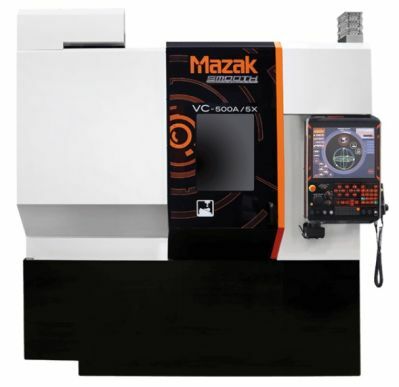 Mazak's MAZATROL SmoothX CNC on the VC-500A/5Xmakes it easy to generate programs for highly complex parts production. It has several advanced functions that allow it to ensure the shortest possible machining cycle times, especially in fine increment programs for simultaneous 5-axis operations and free-form die-mold machining. These functions include High Gain Feed Forward Control, Fast Rotary Axis Speeds, Variable Acceleration Control and Intelligent Pocket Milling. Ergonomics also play an important role in the functionality of the MAZATROL SmoothX CNC. A large 19" display presents all of the critical machine data within a single page view, while the tilt control panel allows for optimum positioning based on operator height. An intuitive multi-touch screen, which is similar to that of a smartphone, enables fast and smooth programming operations. An SD card allows the CNC to store up to 32GB of data. The VC-500A/5X, along with special gear design software and metrology unit, can be integrated into a closed-loop gear machining process. This collaboratively developed process gives job shops a high-precision and cost-effective option to machine -- with standard tooling -- small to medium batch gears.